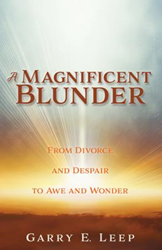 Within the pages of Garry Leep’s new book, A Magnificent Blunder: From Divorce and Despair to Awe and Wonder ($14.99, paperback, 9781545639597; $7.99, e-book, 9781545639603), readers are taken on a journey through the grief, pain, and despair often brought on by divorce and perpetuated by the subsequent dark night of the soul. However, the journey leads the reader into the presence of God, which leads to a life transcended in joy. Today’s world has no adequate solution for the pain we will undoubtedly feel at some time in our lives. The church often misses sharing God’s purpose of pain, but A Magnificent Blunder will offer readers a new hope and purpose in pain and grief, and discover God within. “We naturally hide from pain and hide our pain. The book postulates in story form that pain is a mechanism used by God to call us out of the smallness and limits of our life, by embracing Jesus in the midst of our pain and experience fullness of life,” said Leep. Garry Leep was born into one of the Dutch-Reformed enclaves that surround Chicagoland like a string of pearls. He received an honorable discharge from the US Army and later entered the world of business and commerce. A graduate of Trinity Int., he’s also owned a number of businesses. Xulon Press, a division of Salem Media Group, is the world’s largest Christian self-publisher, with more than 12,000 titles published to date. A Magnificent Blunder is available online through xulonpress.com/bookstore, amazon.com, and barnesandnoble.com.